1. The revolving horse above the awning of the Main Street Army Navy store. 2. Views of the denim blue Gallatin Range running south to Yellowstone National Park. 3. Air that’s invigorating because it is kept fresh-frozen all winter. 4. Fly-fishing shops. One, the Bozeman Angler, is owned by Rod King. I’ve never fly-fished, but when I do, I want to buy gear from Rod King. 5. The revolving horse above the awning of the Main Street Army Navy store. What makes a town suddenly hot? Whatever it is, Bozeman has it. “Bozeman was just a little Montana ranch town,” said my father―who years ago traveled here regularly on business―when I told him I was going to visit. Now Bozeman (pop. 30,000) and all of surrounding Gallatin County (pop. 75,000) are booming. On the edge of town, you see the new houses and shopping centers rising. Slick real estate magazines feature $1.25 million 6,510-square-foot homes with media rooms and wet bars. In the United States, people measure a locale’s cachet by the automobile names it inspires. When ’60s California surf culture crested, you had the Chevy Malibu. Later came the Dodge Durango, the Hyundai Santa Fe. The Chrysler Bozeman? It may happen. You see the changing Bozeman easily enough on any walk down Main Street, where the redbrick buildings seem solid enough to support both tradition and change. There’s the Army Navy store and 125-year-old Owenhouse Hardware. There’s the old Baxter Hotel with its blue light that flashes whenever there’s fresh snow at the city-owned ski resort, Bridger Bowl. But there are also new art galleries and boutiques, and Plonk, a wine bar whose varietals and In-Styled customers appear to have been airlifted from Santa Monica. Naturally, such acclaim has stirred unease among longtime Bozeman residents. “What happens when you become popular and you’re not prepared for it?” asks city commissioner Steve Kirchhoff, a Bozeman native. Some residents look to Aspen, Colorado, and Jackson Hole, Wyoming, to see what they don’t want to be: trophy towns divided between haves and have-nots. Some of them like to point out reasons people shouldn’t move here. The relative lack of high-paying jobs. The five-month-long winters, which usually start at the end of October. (“We learn how to integrate down jackets into the kids’ Halloween costumes,” says Mike Harrelson, who works in advertising here.) Still, the newcomers arrive. Bozeman has a nickname: the Bozone. “We’re just in our own little bubble in the Bozone,” one resident tells me. Now some fear it will gain a new one: Boze Angeles. Kirchhoff thinks his town can pull it off. 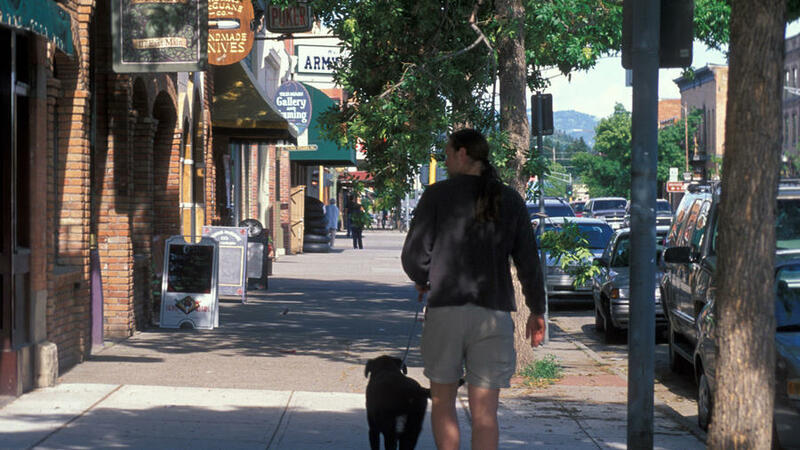 Bozeman, he hopes, can grow in a way that ensures a diverse economy, affordable housing, and an unspoiled environment. He thinks the town’s strong tradition of participatory government―“People argue together here,” he tells me over dinner―will see Bozeman through. I walked back out onto Main Street. There was the Baxter Hotel and the revolving horse. The shiny new and the stable old. The Montana mountains and sky. Every once in a while, by accident and by design, we in the West create a community and actually get it right: a place almost everybody would want to live. INFO: Bozeman Area Chamber of Commerce ( www.bozemanchamber.com or 800/228-4224).